On Friday October 19th, 2018 at 8pm we will be back at the Mill Courtland Community Centre for our monthly Open Stage. 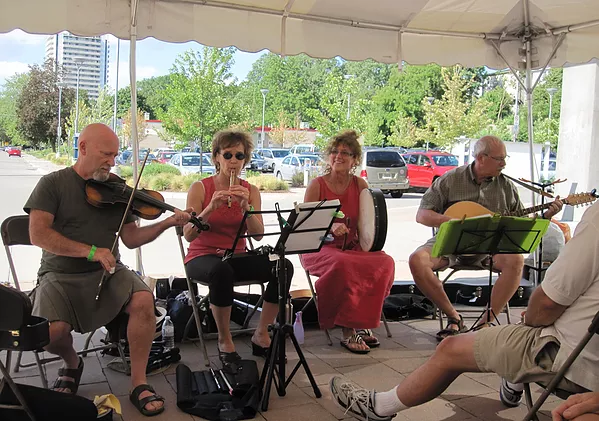 Fair Wind will be the featured performers to start of the evening with a 30 minute set of traditional Celtic music. We have posted our Code of Conduct page which we have adopted so that our event can continue in the Community Centre. The other details are outlined on our About Page. The parking is free at the back of the Mill-Courtland Community Centre and admission is still $3 at the door. the facility is wheelchair accessible, alcohol, smoke and peanut free and every show is different. If you don’t come, you’ll miss it. The next open stage will be November 16th. The Fair Wind sings and plays acoustically, the traditional folk music of England, Ireland, Scotland, and Cape Breton. Comprised of Carole Pines, Ruth Shushan, Mark Pancer, and Bob Mino, they collectively play the fiddle, penny whistle, low whistle, guitar, mandolin, banjolin, Irish bouzouki, banjo, bodhran, harmonica, spoons, and mountain dulcimer. Along with their songs they treat listeners to traditional jigs, reels, and other dance forms mined from the rich heritage of the British Isles and Ireland. The Fair Wind promises to transport listeners with fine harmonies and creative arrangements. The Summer Break is Over. On Friday September 21st, 2018 at 8pm we will be back at the Mill Courtland Community Centre for our monthly Open Stage. There will be no feature set this month so that means lots of time for Open Stage performers. We have posted our Code of Conduct page which we have adopted so that our event can continue in the Community Centre. The other details are outlined on our About Page. The parking is free at the back of the Mill-Courtland Community Centre and admission is still $3 at the door. the facility is wheelchair accessible, alcohol, smoke and peanut free and every show is different. If you don’t come, you’ll miss it. The next open stage will be October 19th. It was the annual Black Walnut for the “second homeless” on the May long weekend, plus for exceptional reasons our Committee was short-handed. Still, thanks to our faithful few a successful production was staged. For our next date on Friday June 15, 2018 at 8pm, we will start out with a feature set by Gordon Castle, which will without a doubt be a very interesting musical event.